With the dawn of automation, industries all over the world are depending on robots to carry out tasks, such as product designing and manufacturing. It optimizes repetitive processes and improves cost efficiency. 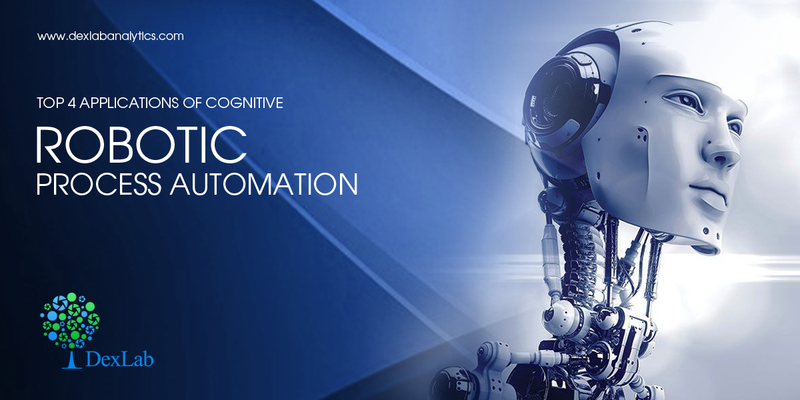 Incorporation of cognitive capabilities, like natural language processing and speech recognition into robotic process automation has resulted in the birth of Cognitive Robotic Process Automation (CRPA). Let’s delve into the current applications of this revolutionary technology. Customers are demanding expedient methods to transfer money and make investments. Also, the volumes of customer data are increasing rapidly. Hence, banks need to improve the speed of information processing. To achieve this, they have turned to process automation. Many banks are adopting AI-powered technology to automate regular processes. According to a survey conducted by BIS Research, Banking and Finance sector is likely to become the largest revenue generator in the world for CRPA industry. For example, Bank SEB in Sweden bought cognitive robotic process automation software from IPsoft, a foremost company of CRPA industry. This technology is actually a software robot named Amelia that has knowledge of 20 different languages and is aware of semantics, including English and Swedish. In case Amelia fails to solve the problem at hand, it transfers the same to a human operator, and studies the interaction to hone its skills and apply it to similar cases in future. U.K.’s KPMG has collaborated with Automation Anywhere to provide digital staff for clients. Developed economies, including U.S. and the European nations are extensively employing RPA/CRPA bots. AXA Group, one of the chief French insurance companies using smart automation services to improve its bankroll, reported that France has the fifth highest insurance premiums in the world. Leading IT service provider of Australia, DXC Technology, has partnered with Blue Prism, one of the best companies providing RPA solutions, to improve the RPA capabilities for key insurance clients, like Australia and New Zealand Banking Group (ANZ). Fukoku Mutual Life Insurance, top insurance firm of Japan, has replaced 30 human workers with IBM’s latest AI tech, Watson Explorer. The tech’s deployment has boosted company savings and enhanced productivity by 30%. Business process outsourcing (BPO) services are facing problems like increased operational costs and low profit margins. RPA/CRPA software bots can be one of the ways to tackle this problem. Hexaware Technologies, a topnotch company in this field, has partnered with Workfusion to evolve IT infrastructure, combat the aforementioned problems and boost overall productivity. Maintaining paper records of patients’ medical documents. Innovation in healthcare encounter regulatory and reporting challenges when launching new drugs. These tasks are repetitive and increase chances of errors when done manually. Automation helps tackle these problems and also provide safe and good quality drugs to the market. Blue Prism is one of the principal providers of RPA for healthcare. Competition in the global capital markets is increasing. New contestants are bringing in ‘’disruptive technologies’’ that are pressurizing existing institutes to increase their efficiency and cut down costs. Hence, the need to embrace cognitive automated technology. Australia and Japan are among the top countries adopting process automation. Leading countries embracing RPA for financial services include India, China and Singapore. It is expected that Fintechs will mainly disrupt three areas of financial sector-consumer banking, investment handling, fund and payment transfer. It is about time that all businesses and organizations integrate machine learning and artificial intelligence in their processes for competitive advantage. How can you take advantage of this tech-driven era? Enroll for machine learning training in Delhi at DexLab Analytics. Many top companies look for expertise in this budding technology while recruiting employees. DexLab’s Machine learning course in Delhi offers superior guidance that will help you develop crucial knowledge needed to stay ahead of competition.